Today, South Africa launched its National Action Plan to combat xenophobia, racism, and discrimination, marking an important step towards addressing the widespread human rights abuses arising from xenophobic and gender-based violence and discrimination that continue to plague South Africa. The five-year plan, developed in a consultative process between the government and civil society, aims to raise public awareness about anti-racism and equality measures, improve access to justice and better protection for victims, and increase anti-discrimination efforts to help achieve greater equality and justice. But the Action Plan fails to address a key challenge fueling the problem: South Africa's lack of accountability for xenophobic crimes. Virtually no one has been convicted for past outbreaks of xenophobic violence, including the Durban violence of April 2015 that displaced thousands of foreign nationals, and the 2008 attacks on foreigners, which resulted in the deaths of more than 60 people across the country. 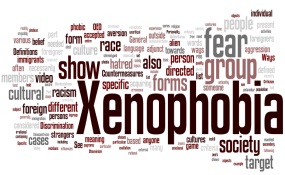 To effectively combat xenophobia, the government and police need to publicly acknowledge attacks on foreign nationals and their property as xenophobic and take decisive action. This should include ensuring proper police investigations of xenophobic crimes and holding those responsible to account. Inflammatory public statements - such as those made by Johannesburg mayor Herman Mashaba in December 2016, blaming illegal immigrants for crimes and calling on them to leave the city - should be strongly condemned. As South Africa prepares for national elections on May 8, 2019, political leaders should not incite xenophobic violence or promote discrimination. The National Action Plan is a welcome development indicating the South African government's intent to fight xenophobia, racism, and all forms of discrimination and prejudice. Now it should fully implement that plan, and work to stem the dangerous tides of intolerance for good.